Adults 65 and older are predominately more at risk for falls, which can dramatically reduce their active lifestyle and independence. While their recovery time can take significantly longer than their younger counterparts – it doesn’t mean that young people have nothing to worry about. Clutter in walkways, poor lighting, open drawers and uneven surfaces are all common tripping hazards that can plague young and old. 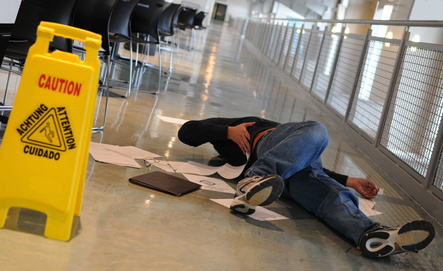 While a slippery step or icy walkway can knock even the surest of stable folk off their balance – there are some areas where you can dramatically limit the amount of hazards in your home or workplace. Mark spills with warning signs. Mop or sweep up debris from floors. Secure mats and carpets with tape to ensure they remain flat. Close cabinets or drawers when not in use. Keep workplaces and walkways well-lit. Replace burned-out lightbulbs and faulty switches. Walking surfaces can be made safer by replacing unsafe floors, installing mats or adding abrasive strips. In workplaces with oily or wet floors, or where workers spend a lot of time outdoors, proper footwear is important to prevent slipping and tripping. Because of the multiple hazardous conditions that exist – as well as a large range of safety footwear – employers should consult with manufacturers to determine the best shoe for any particular job. Pay attention when walking – and do not rush. Be mindful of each step you take. Walk with feet pointed slightly outward for better traction. Make wide turns at corners. Sharper turns can create an angle to which leaves you more susceptible to slip. Keep flooring in good condition. Have a flashlight handy in case you enter a room with little or no lighting. Ensure views are not obstructed. Our lawyers at Graves and Richard are highly experienced in representing victims seeking compensation from occupiers’ liability claims.